In the end, AzhwAr says “In the abodes where there are those who are well versed in reciting this decad, emperumAn will himself descend and be eternally together [with such devotees]”. Subsequently, AzhwAr declares the result as “the abode where those who are well versed in reciting this decad, will become paramapadham (spiritual realm)”. AzhwAr, the leader of those who dwell in [AzhwAr]thirunagari which is having greatly fragrant garden, mercifully spoke about krishNa who is having beautiful form, abundant like blackish sea which is noisy due to rising tides, in this distinguished decad which is having poetic aspects such as ezhuththu, asai, sIr, thaLai, adi, thodai, pA, isai, thALam and other decorative aspects and is in andhAdhi meter, among the thousand pAsurams; for those who can recite just the pAsurams (without understanding anything more) of this decad, the towns/abodes where they are located are to be said to have the bliss of paramapadham. iraikkum karum kadal vaNNan – nanjIyar came [from thirunArAyaNapuram] and mercifully mentioned to bhattar saying that he heard this from ananthAzhwAn – As the ocean heard SrI rAma’s [angry] words in SrI rAmAyaNam yudhdha kANdam 21.22 “chApamAnaya” (Oh lakshmaNa! bring my arrows), it became greatly agitated; in the same way emperumAn‘s supremacy got agitated on hearing her firm decision to engage in madal. vaNNan implies one who has such nature. kadal vaNNan – His great beauty which is to pursued even by engaging in madal, is explained here. One who is having an invigorating form like that of an ocean with rising tides. 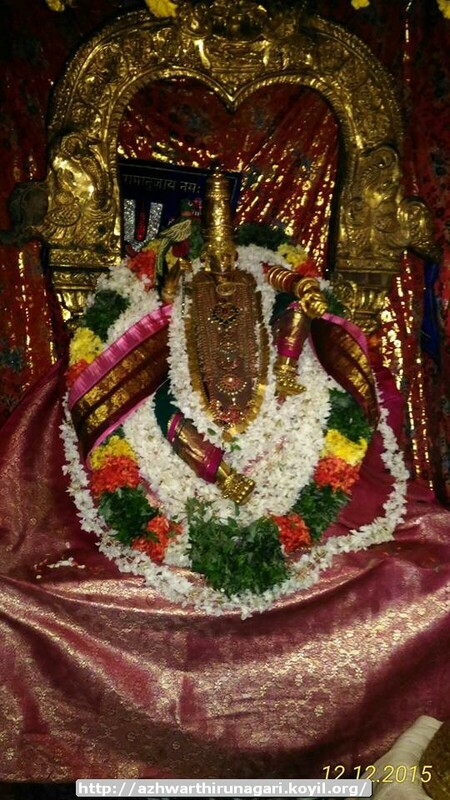 kaNNa pirAn thannai – krishNa, who gave that form as a favour to me. Thus his beautiful form and his nature are explained. viraik koL pozhil – As she set out to engage in madal, the town became filled with fragrance of freshly blossomed flowers, expecting his arrival. niraik koL andhAdhi – Though he engages in madal without any specific plan, the various poetic aspects fell in place in the prabandham naturally. As said in SrI rAmAyaNam bAla kANdam 2.40 “SOkaSSlOkathvamAgatha:” (as the SlOkam followed the SOkam (sorrow)), though SrI rAmAyaNam was started out of sorrow, by brahmA’s grace, all aspects fell in place for it; similarly, though AzhwAr was grieved and could not even start the prabandham, the prabandham started flowing by bhagavAn‘s grace and thus there is nothing wrong in saying that every poetic aspect fell in place naturally. uraikka vallArkku – One need not engage in madal, it is sufficient to recite this pAsuram. vaigundham Agum tham UrellAm – Their target abode is paramapadham. Alternative explanation – not to have them set out to engage in madal to be known by everyone, he himself descends to wherever they are and remains together with them eternally; hence, their abodes can be called as paramapadham. There is nothing wrong in saying that wherever his presence is, that abode is SrIvaikuNtam. One cannot doubt “Is it possible to attain this just for [reciting] this pAsuram?”; if we consider the qualities of bhagavAn explained in this decad, one can understand that he is of the nature where even this singing is extraneous [to get his mercy]; and if he will not show his mercy for reciting this pAsuram, it can be said that there is no use of paripUrNa AsrayaNa [complete surrender – paramabhakthi stage] too; if this is not the case, even purushOththama can be considered as any other mortal being. In the next article we will enjoy the next decad. This entry was posted in thiruvAimozhi, thiruvAimozhi 5th centum on June 24, 2017 by Sarathy Thothathri.